Now, I’m sure you’ve read my review of Boothferry Park and might have been surprised by my liking for a ground of it’s style. 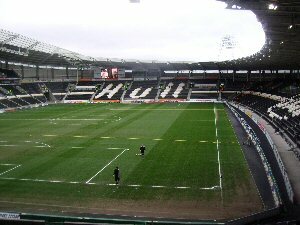 Hull then relocated to this ground, the KC Stadium. As usual, getting to the ground involves you going through the lovely experience that downtown Hull. It’s not a pleasant journey once you’re over the bridge but at least it’s a short trip. Anyway, once you get to the ground, it’s a bit awkward due to the stewards. They try and separate you from the Hull fans which is odd because they’re prepared to let Hull fans to walk between them and into the crowd of away fans but not the other way around, and the only programme sellers are on the opposite side of the stewards go getting a programme is awkward. However, the programme is worth the money paid. 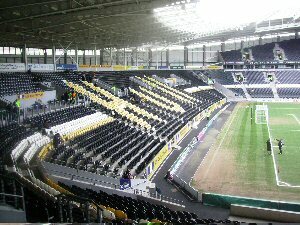 One inside the ground, you walk up a random flight of stairs before finally getting into the ground. 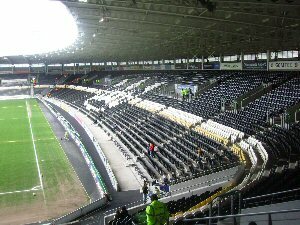 Now I’ve been to Old Trafford, Anfield, Highbury, Stamford Bridge, St James’ Park and many other grounds like that and not once have I been as gobsmacked as I was when I was first inside the KC Stadium. I remember first walking through the little tunnel but was concentrating more on looking for a decent seat. I found one, looked out into the stadium and you could have threw a cricketball into my mouth. I was truly stunned. Although the stadium was quite basic in design, it just seemed huge. 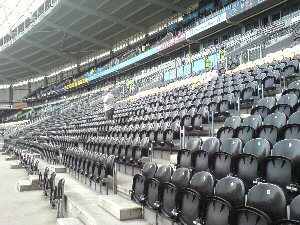 The ground was basically a bowl with black seats, the only stand with a second tier was the stand to away fans’ right which had the KC logo on it. 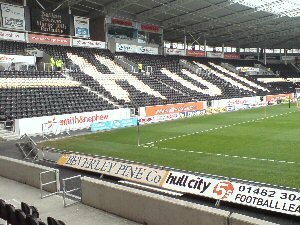 On the stands behind each goal, the word Hull was written with both white and amber outlining. The view from the away end was impressive to say the least, you even got an incredibly great view of the action at the other end. Now, Hull’s chanting extent this day was limited to chants of “Who are ya”, which might I add, is the stupidest chant ever. There weren’t many of these people singing it. 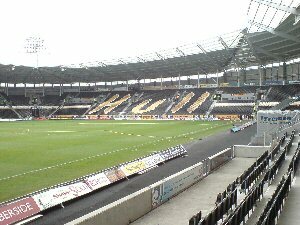 Infact, in my 3 visits to Hull, I’ve only heard them convincingly singly once and that was only when they were winning (hardly suprising) in my last visit. Other than that, they’ve been relatively quiet. 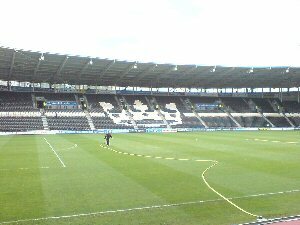 The game was quite eventful but the decisive moment was a Stuart Bimson penalty which saw Lincoln became the first away side to win inside the KC Stadium. 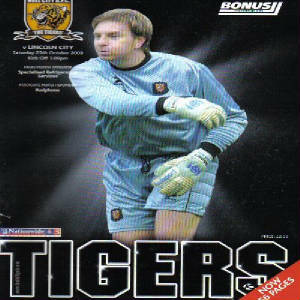 Then, after both games, came various moments that let Hull down. The first came just after our win, Lincoln fans were asked to be kept behind so we all stayed. The bunch of Hull fans in the corner next to us stayed behind. About 10 minutes after the game had finished, Lincoln players came back out to warm down and were greeted with great applause from the City fans, but the Hull fans who stayed behind, tried to storm the pitch and attack Lincoln’s players. The second was heading back just after they had beat us 3-0 in October 2003. We had been kept behind again and Hull fans had waited along the exit route for the coach and throw everything from bricks to Mars Bars at the coaches. 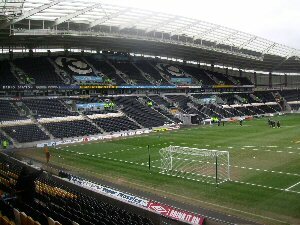 Overall, I have mixed feelings about Hull, I love going to the ground but the fans make it a negative experience over all. Arguably the best ground outside of the Premiership and as a ground, it’s one of my favourites but until they fix their hooligan problems, I certainly wouldn’t want to take my family there.